BAE Systems Maritime – Naval Ships business specialises in naval ship design, build and combat systems capability for the surface fleet. As the largest shipbuilding company in the UK, and one of the largest in Europe, BAE Systems operates shipyards at Scotstoun and Govan on the River Clyde in Glasgow and has shipbuilding facilities within the Naval Base at Portsmouth employing about 6,000 people. BAE Systems delivers maritime capability to the UK Ministry of Defence (MoD) and other navies around the globe. Its experience in military naval design, construction and delivery of complex whole ship, design, build and integration encompasses the entire spectrum of military vessels from aircraft carriers, amphibious/auxiliary vessels, destroyers, frigates, corvettes, offshore patrol vessels, fast attack craft, right through to mine countermeasure vessels, patrol boats, fast interceptor craft and rigid inflatable boats. Through a 15-year terms of business agreement with the UK MoD, it is providing the backbone of the Royal Navy’s surface fleet for the next 30 years and beyond. In 2010 the Royal Navy awarded a £127m four-year development contract to BAE Systems for the design of its planned Type 26 Global Combat Ship (T26 GCS). During this assessment phase (AP), BAE Systems and the MoD will consider design proposals for the T26 GCS. The AP is not expected to be completed until late 2013, with the main investment decision being made by the middle of this decade, at which point the budget will be confirmed and orders placed. Following the award of the AP contract, the Strategic Defence and Security Review confirmed that the T26 GCS would begin replacing the Type 23 Frigates as soon after 2020 as possible. "With Paramarine we can very rapidly gain a powerful insight into the impact of structural changes to aid the decision-making process." 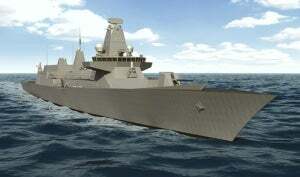 The T26 GCS is a globally deployable and sustainable warship that will form the spine of the Royal Navy’s future fleet. It is a task group enabled anti submarine warfare warship and will combine the capabilities necessary to protect maritime task groups, the strategic deterrent and land forces, with the flexibility to conduct a wide range of other tasks. Versatile and modular in design, all variants will share a common, acoustically quiet hull and realise economies of scale from a rationalised build and procurement process, as well as substantial through-life cost savings, especially in training, maintenance and logistic support. The T26 GCS will be a highly capable, versatile, sustainable, adaptable and affordable warship, designed to meet tomorrow’s threats. Paramarine has been and is used extensively across BAE Systems on projects such as the Astute class of submarines, Type 45 Royal Navy ships, and the new aircraft carrier programmes. Paramine is approved by the MoD as its stability software of choice, and BAE Systems has extensive experience and understanding of its capabilities. There are two primary areas where Paramarine is used by BAE Systems in the assessment phase of the T26 GCS project: early stage design and structural development. Paramarine allows naval architects to build models and make changes very easily, giving them the ability to explore multiple options efficiently and effectively. Each time a new option is created, Paramarine is able to carry out rapid stability and structural checks. "We are charged with developing a design that generates the most effective balance of cost versus benefit. We develop different configurations to assess the impact on the cost of building the ship. Paramarine enables us to develop and test scores of options in the early design stage," observed Chris Muskett, engineering manager hull & structure, BAE Systems Maritime – Naval Ships business. Paramarine gives the ship designers the ability to assess very quickly the impact of small structural changes to ship weight. "Before working with Paramarine, the naval architects had to calculate the impact of small structural changes to the design. With Paramarine we can very rapidly gain a powerful insight into the impact of structural changes to aid the decision-making process," said Chris Muskett. Paramarine is a user-friendly and highly flexible tool that is particularly effective in the generation and development of early stage designs. It allows naval architects to develop multiple ship designs and models rapidly. A key element of the solution that QinetiQ GRC offers over and above other software providers is in its extensive range of support services. For example, QinetiQ GRC has extensive experience working in the concept design arena and in particular on military projects. The experience gained is put to good use as part of the comprehensive support package that QinetiQ GRC offers its customers. "Paramarine is a powerful and effective ship design solution that is very flexible. It is supported by a responsive and highly knowledgeable customer support team," commented Chris Muskett.